Dr. Deutsch of Perimeter Plastic Surgery advises tummy tuck patients to schedule procedure during winter months for increased comfort during postoperative healing. Atlanta plastic surgery practice, Perimeter Plastic Surgery, encourages patients to consider seasonal advantages when planning a tummy tuck and other cosmetic procedures. There are distinct benefits that winter months offer during a patient’s postoperative healing period, including discreet recovery and reduced sun exposure. Compression garments are mandatory for patients several weeks following a tummy tuck to control swelling and improve results. During colder months, garments can be hidden under bulkier winter clothing, and no wardrobe restrictions are necessary. 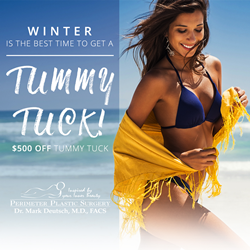 To encourage patients to take advantage of these wintertime benefits, Perimeter Plastic Surgery is offering $500 off a tummy tuck procedure. To schedule a complimentary consultation, contact Perimeter Plastic Surgery at 404-255-0886. Consultation requests can also be made by filling out the online contact form at https://www.perimeterplasticsurgery.com/contact/. Perimeter Plastic Surgery is one of the top plastic surgery practices with locations in Atlanta and Fayetteville, Georgia. Owner and founder of the practice, Mark Deutsch, MD, FACS, has over 20 years of plastic surgery experience, is double board-certified, and has been named a Top Doctor in Atlanta by Castle Connolly for three years in a row: 2016, 2017, and 2018. Perimeter Plastic Surgery’s Atlanta office is located in Northside Hospital’s Northside Doctor’s Center on Johnson Ferry Road. For more information about Dr. Deutsch and Perimeter Plastic Surgery, please visit https://perimeterplasticsurgery.com.